If you are boring on Sunday afternoon, Fosjoas K1 cheap electric skateboard will amuse you. Skateboarding is a popular sport among all people, whether they are kids or the elderly. 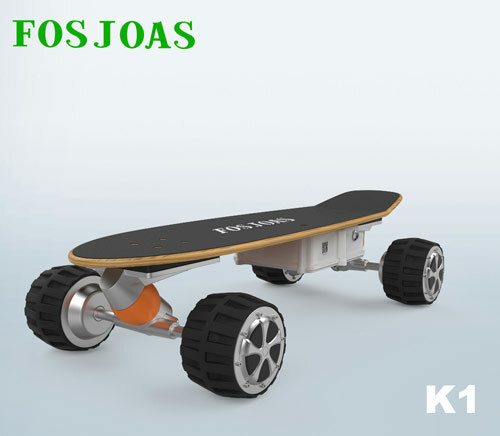 When it comes to Fosjoas K1 motorized skateboard, it is a brand-new and cutting-edge works in skateboarding world. You can ride it heartily and even if an afternoon riding won’t make you fatigued at all. It can kill your boring time and make your life meaningful. What is more, it is more than a plaything, but also a useful tool in your daily life. For example, if the distance between your work place and house is within 10km, Fosjoas K1 motorized skateboard will be your best commute tool. Don’t forget that it is powered by 162.8Wh lithium-ion battery. Stand on the board of Fosjoas K1 electric skateboard and slightly lean forward. Then, it will move forward automatically and take you to anywhere. If you slightly lean backward, it will slow down until stop. If you turn left or right, it will change direction. The 2.4G wireless variable speed remote control can help you realize different controls in your hands. You are always the dominator. You can ride it to find a delicate library and read your loved books there. You also can ride it to a chic coffee house. Ask for a cup of cappuccino and watch a classical movie. It also can take you to find a delicious food shop and enjoy foods there. Besides killing boring time, Fosjoas K1 self-balancing air board also can be your tool in daily life. It is powered by lithium-ion battery and has two capacities: 81.4Wh and 162.8 Wh. Therefore, it offers you certain range. In other words, it can be your transport to your work place or other destinations. It facilitates your daily travels. Next：Why Do You Need a Fosjoas K2 Two-Wheeled Electric Scooter in Your Daily life?